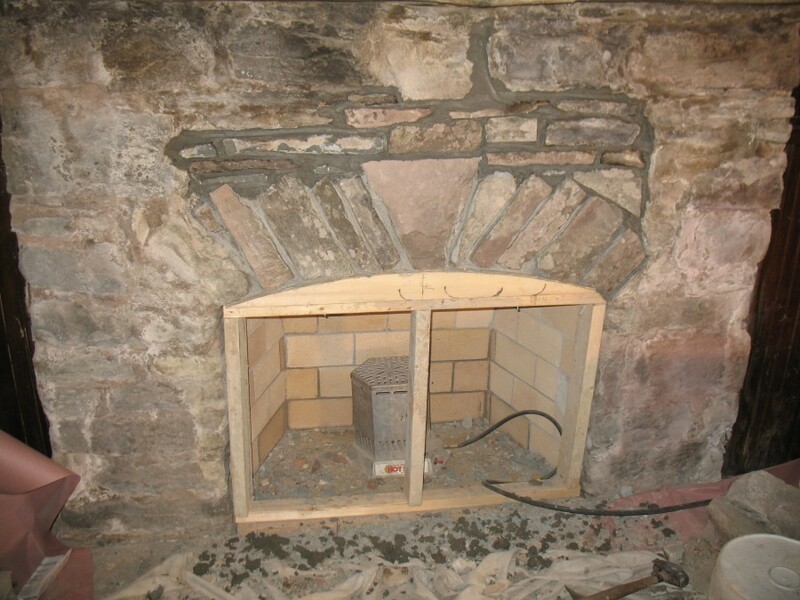 Showing the arch under construction and the stone mantle. David Knox of Cassella Construction Corporation of Red Hook, New York rebuilt this native stone fireplace for the Tuckaway vacation cabin in the Catskill mountains. 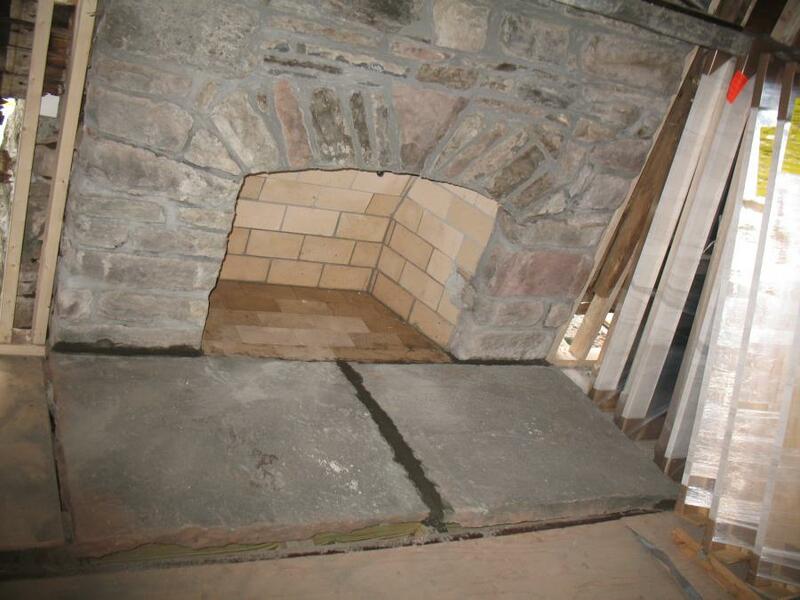 The fireplace was part of a larger project, which included restoration of the stone chimney. The Arts and Crafts cottage architectural style depends on the use of primitive, unfinished materials in an artful way to produce an elegant result. The intent in this case was to return the appearance to the intent of the original builders, removing later alterations. 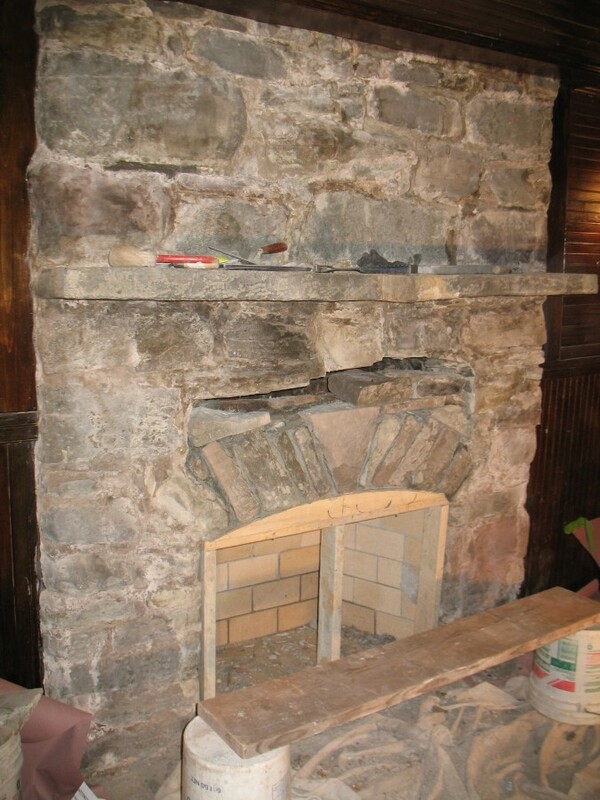 Cassella disassembled the fireplace span in order to build a “keystone” arch over the firebox. Shrewd selection of the natural stone was critical for the final result – – note the keystone, itself. When new stone was needed, it was quarried right on the property, including a sizable monolithic hearthstone. To quote Wikipedia on the attributes of the Arts and Crafts style, they are “originality, simplicity of form, local natural materials, and the visibility of handicraft”. The Tuckaway fireplace project satisfies all four points completely. David Knox is a Member of the Guild of Building Artisans. List of Masonry Restoration Contractors. Note the new hearthstones, quarried on the property. This entry was posted in Stonework and tagged New York. Bookmark the permalink.